The lipid A analogs used in preclinical studies and clinical trials are not naturally-occurring forms of lipid A; they are synthetic molecules produced to be less toxic than lipid A itself and they do not reproduce the effects of natural lipid A molecules especially in vivo. The responses induced by lipid A analogs are summarized in this chapter: their fate in the blood stream and their toxicity as well as the lipid A tolerance and the tumor immune responses they induce. 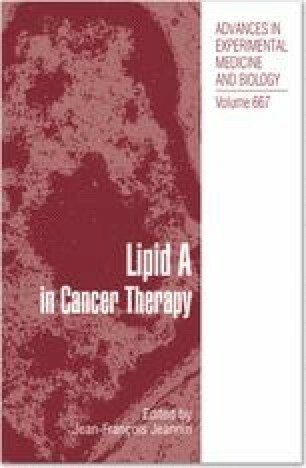 Lipid A is not found in the mammalian organism under normal circumstances so its use in cancer therapy raises important questions as to its different effects in vivo and its toxicity, particularly in cancer patients. Lipid A has to be injected intravenously (i.v.) to study its effects. Injections of chemically synthesized lipid A in humans and in animals produce sepsis symptoms, such as tachycardia, tachypnea, hyper or hypothermia and leukocytosis or leukopenia. Similar manifestations are observed after injection of purified lipopolysaccharide (LPS), which is why lipid A is usually thought of as the active part of LPS. While lipid A injection is therefore expected to induce reactions similar to septic shock, the lipid A molecules used to treat cancer are not natural forms but analogs, produced by chemical synthesis or genetic engineering, specifically selected for their low toxicity. The in vivo effects of such low-toxicity lipid A analogs are summarized in this chapter.